"Two youthful pioneers brought together through a pipe dream and a couple of warm beers embarked on an abysmal attempt at cycling." It was almost as though every part of this journey was in writing. We were just the actors playing it out; things just happened and we followed. Two youthful pioneers brought together through a pipe dream and a couple of warm beers embarked on an abysmal attempt at cycling. I’d been friends with Matt since school, during college we’d embarked on adventures to Greece and the majority of the UK via train, though this would be our first major cycling escapade. I’d been working in a pizza restaurant and Matt in a gas station, both awaiting the start of University; I’d be studying journalism and Matt would be studying film and television. 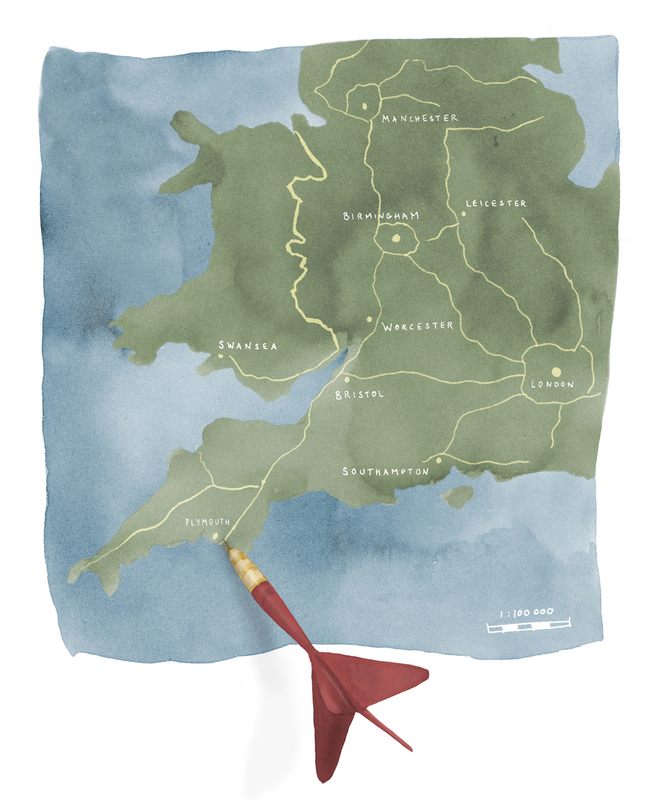 I’d thrown a dart towards a map of Britain which landed near Plymouth, we’d laughed at the prospect of cycling so far, oblivious to its significance. Something we’d laughed at became reality and the trip was planned. We’d heard of great cyclists stamping their rubber across the majority of Great Britain, leaving tracks on mossy mountains in the fresh air of Sgòr an Lochain Uaine and passing through the city scopes of Edinburgh, Bristol, Newquay and finally perching on the breaches of Land's End. With little time to plan, or even equip ourselves we purchased two cheap mountain bikes, mine from a petite shop, once a newsagents; where I’d grab my pick and mix before school, newly converted into a bike shop just on the high street. A revamped sturdy looking Apollo mountain bike was my initial choice. However, Mr Bike–omatic swiftly settled my anxiety and made sure I knew that I knew nothing about bikes. We figured riding from Worcester up to John O Groats and back down to Worcester was utterly stupid, so we settled on Worcester to Land's End. Two big rucksacks, mine green, good camouflage for those short excursions through forests, Matt went for red and black, just so we didn’t look too similar, after all we wanted to look like experienced travelers, not amateurs. From Worcester to Gloucester it took no more than a couple of steep hills and a few busy A roads.Matt’s bike looked unsteady, as though it wasn’t prepared to carry a six foot rugby player. I could hear it clattering along behind me, and I’d often hear Matt’s nervy grunts as the bike would suddenly click into gear unexpectedly. Our tracking from Gloucester to Bristol was inept to say the least. We’d found a canal and immediately assumed it would lead us in the right direction, a careless acknowledgment settled the deal. Deep down I began to believe this canal was never ending, the temperature was rising and the light brown crisp dirt forging our path was reflecting an unbearable blaze onto our bare faces, luckily my youthful family exertions as a child to Italy, Spain and Greece meant that I’d turn a nice olive brown, which was little to be said about the slowly transforming Zoidberg behind me. We left the canal abruptly and took a canal to a dock flooded with cast iron rust and a clinging hook grappled by a long swinging chain echoing across a plain with no one in sight. Standing firm, we found a local pub that sat on the other side of the plain, behind the shadowed line of several large cedar trees, and locked our bikes on a wooden railing just outside. At this point I was alone as Matt was struggling to cope with the heat stroke, I wondered into the bar and ordered two cokes with ice and explained that my friend was the worst for wear, he grabbed a bag of ice from the fridge – didn’t say anything but a grunt – and slammed two large cokes on the bar with his palm planted in front. Mustering up the energy, we continued riding to Highbridge hopped on a train to Newquay and promised it would stay between us.